Arwen, dulcimer # 13. Over a meter long. Freeform abalone inlay, walnut top and fretboard, maple sides, cherry back. 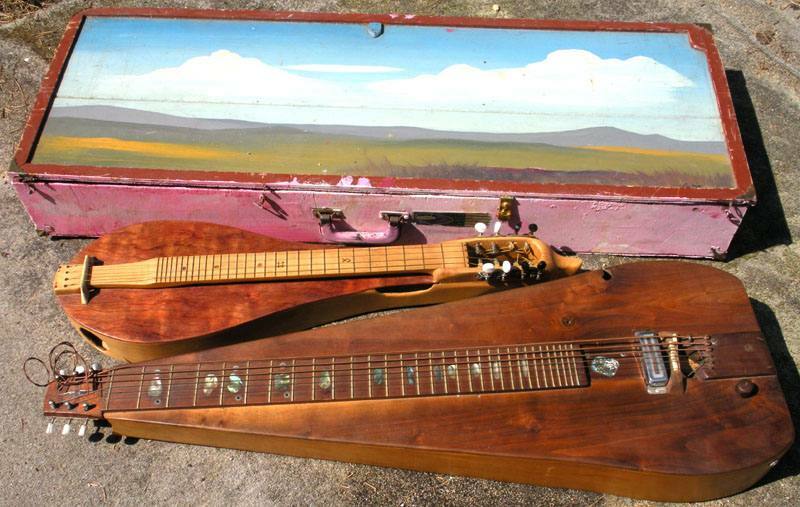 Recycled electric guitar pickup. Strung with three each electric bass and guitar strings. Lowest note: low D on the piano using electric bass strings, bass A string using guitar strings. Sounds gorgeous, though as an acoustic it's rather quiet, but the body's bridge-end is open like the Planet Killer to facilitate miking. It's the acoustic bass dulcimer on Monday Morning Blues and Doney Gal , and the electric bass dulcimer on Black Jack Davey. Dior (# 28) was built to replace Dulcimer #17, Merian, another dulcimer of similar size that was stupidly given away. Many advanced features: four sympathetic strings, so it's a "dolcemelo d'amore". The fretboard, rounded to facilitate bar-chords, is free of the soundboard, to which sound is transmitted straight from the strings via the banjo-style bridge, all of which increases volume. The soundholes are on the sides where they don't compromise soundboard resonance. The paneling-and-pine case has a generic landscape painted by Patricia Windrow . 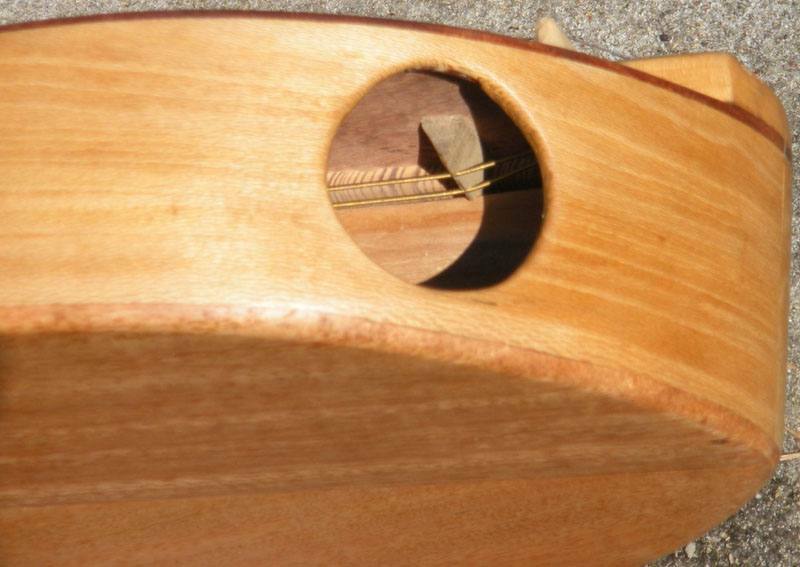 Scroll down for closeups of Arwen's peghead and Dior's side-soundhole showing the internal sympathetic strings. Arwen's peghead. The washer-like things between first and second fret (the leftmost fret is actually the Nut!) 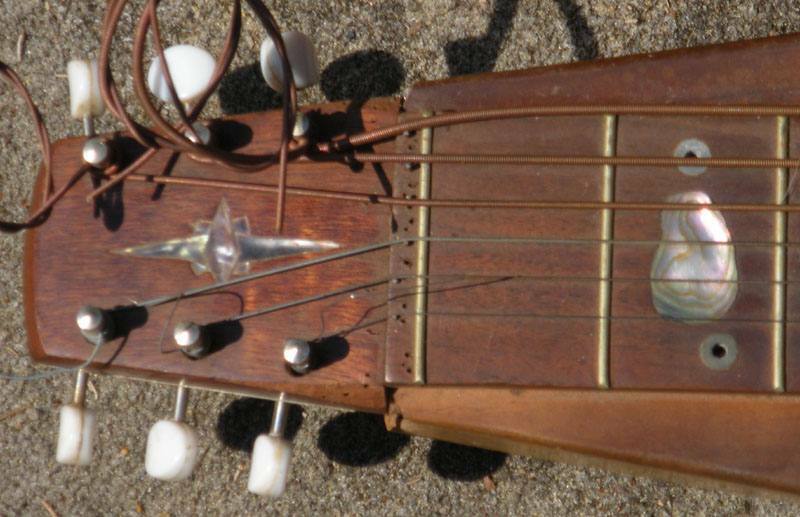 are inlaid nuts for bolting on a capo, a very impractical and quickly abandoned solution to capoing a dulcimer. Dior's soundhole with two sympathetic strings visible inside, with their own bridge to the soundboard.